Ohhhhh, house cleaning. It’s one of those necessary evils we all need to do, but few of us actually want to do. We all want a fresh and tidy home, but let’s face it – life gets busy. No one wants to spend countless hours cleaning when they could be doing something much more enjoyable like baking a pie, decorating the tree or sharing laughs with family. Though we all aim towards a Pinterest-worthy home, not many of us know how to achieve it. (Let alone, how to get there fast.) In today’s blog, we’ll explore three strategies that can help you create a consistent house cleaning schedule in 2019. Feeling overwhelmed? It’s okay to take it one step at a time. Tally up the rooms in your home and document your cleaning process from start to finish. Next, divide each room’s tasks into two sections: maintenance and deep cleaning. It also helps to note the time it takes to complete each room in case you find yourself in a rush before company arrives. Using an established system like the room breakdown strategy ensures that cleaning tasks actually get done (especially the small ones we let slip through the cracks every now and then). If you’re unsure where to get started, here’s an example of a living room checklist to refer to. With a weekly plan in place, you can keep your home tidier on a regular basis. This strategy helps you build strong cleaning habits and often times, improve your cleaning abilities – allowing you to get more done in less time. For a weekly routine, we recommend laminating a revolving checklist and checking off items in dry erase marker as you complete them. If you get done early and have some time to spare, feel free to add in extra tasks. When the week is over, simply wipe your slate clean and begin again. Here’s a weekly template to save you even more time. Now, if you’re looking for a strategy that saves you a ton of time and stress, you should consider hiring a maid service. From move-outs to post-construction and deep cleanings, our team at 2 Green Chicks can tackle it all. We also offer one-time, weekly, bi-weekly and monthly cleanings centered around a schedule that works for you. If you’re thinking of enlisting some help this holiday, reach out to us today at (405) 928-8535 to learn more about our cleaning packages! How do you tackle house cleaning? Have some tips and tricks of your own? Share with us in the comments below! If you’re thinking of enlisting some help this holiday, reach out to us today at (405) 928-8535 to learn more about our cleaning packages! Is your home in need of a little love this holiday? 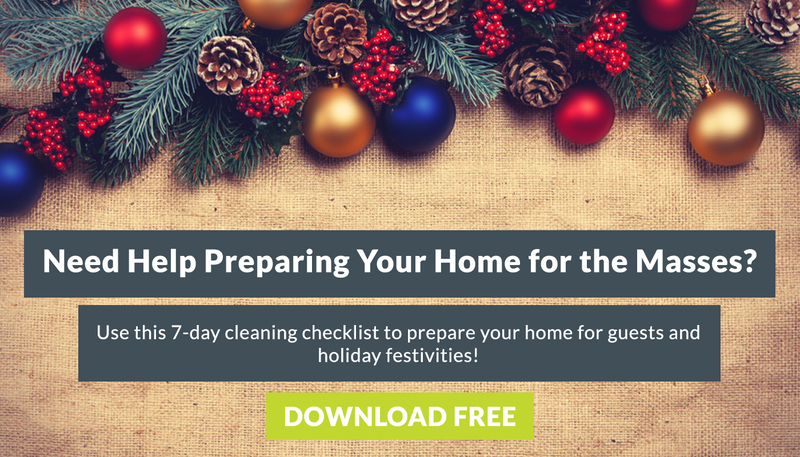 In this free checklist, we break your holiday to-dos into seven digestible sessions (that satisfy the pickiest of mothers-in-law) so you can spend less time cleaning and more time making memories. Click below to access it now.